Colonial Gardens was established in 1964 by Carl Korbel and Elizabeth Klaus. 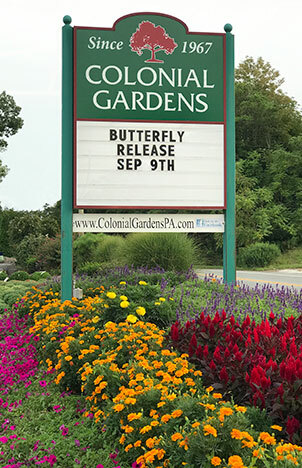 It was orginally known as Colonial Garden Center. During the 3 years it was owned by Mr. Korbel, the store consisted of a small section that is now our cash register room. In 1967 it was purchased by Stan Schmidt and Phil Spinelli. It was operated as a partnership until 1969 when Mr. Schmidt became the sole owner. A year later, the business was incorporated as Colonial Garden Center, Inc. Early products included houseplants, terrariums, produce, annuals, perrenials, shrubs, bagged soils, and mulch. In the 1970’s the middle barn room, lower gift shop, florist area, and warehouse were constructed. In October of ’76 our florist branch in Pottstown was opened on High Street, across from the Hill School. Both stores became known as Colonial Gardens. The 70’s included an expansion into gifts, lawn care products, tools, chemicals, and fresh flowers. Landscaping also became a significant part of the store from the early 70’s until the 80’s when it was discontinued again until the the early 90’s. 1982 and 1983 were years of a large expansion with the addition of a 3700 square foot garden house and a roofed breezeway along with the renovation of the storefront and paving of the front parking lot. One of our most successful ventures began in 1983 with the addition of Pumpkinland in October, which continues to this day, providing entertainment for visitors across generations. By 1984, the Pottstown branch was sold and Haines Florist in Royersford was purchased. The following year the physical assets and personnel of Haines Florist were moved to our Phoenixville location. The 1990’s saw further expansion with the 2300 square foot second garden house. 1990 was also the beginning of Colonial’s Haunted Gardens including the Haunted Woods Hayride and the Haunted House of Horrors. During this decade landscaping design once again became part of Colonial Gardens’ service, and it was eventually expanded into design and install in the following decade. The new century was followed with more renovation and expansion in 2003. Colonial Gardens added a pole barn and renovated the store front as well as the front sign once again. Unfortunately, our beloved owner Stanley Schmidt passed in 2006, leaving the store in the hands of his son and current owner, Eric Schmidt. Colonial Gardens’ services have continued to grow with a rapidly expanding floral department and landscape services. In December of 2012, Colonial Gardens purchased the six acres on its east side that it had rented for the last 30 years. Currently, the area is being expanded into an agricultural entertainment and event rental facility to include a privet maze, herbal labrynth, green roofed chicken house, garden art, and a Christmas light show. Colonial Gardens is grateful for our loyal customers and staff who have kept us going for these 53 wonderful years. We look forward to continuing our tradition of being a family oriented and operated business and serving our community for years to come.